Hugo Slot is an online video slot with an animated theme, where the main character is called Hugo. 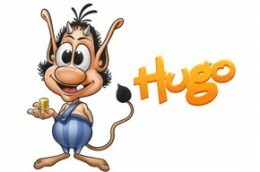 Actually, this slot is inspired by the famous Danish character – Hugo the Troll – which was invented back in 1990 by a Danish television company. Hugo is a 5-reels slot with 10 paylines and was brought to you by Play ‘N Go software platform. The game is playable on all devices (desktop, mobile, tablet devices) from 10p per spin. The game offers to its player two separate bonus features, free spins, cash prizes and stacked extra scatter symbol. The lower value symbols are the standard playing cards (A, K, Q, J and 10), while the higher value ones are digging picks, bags of gold, dynamite sticks, and golden nuggets. The wild symbol is represented by Hugo himself.